LaLa Lunchbox is the best-selling meal planning app designed specifically for kids and families. It's a fun and educational experience that empowers kids to make healthy choices. Using LaLa Lunchbox helps families save money and time, and waste less food. 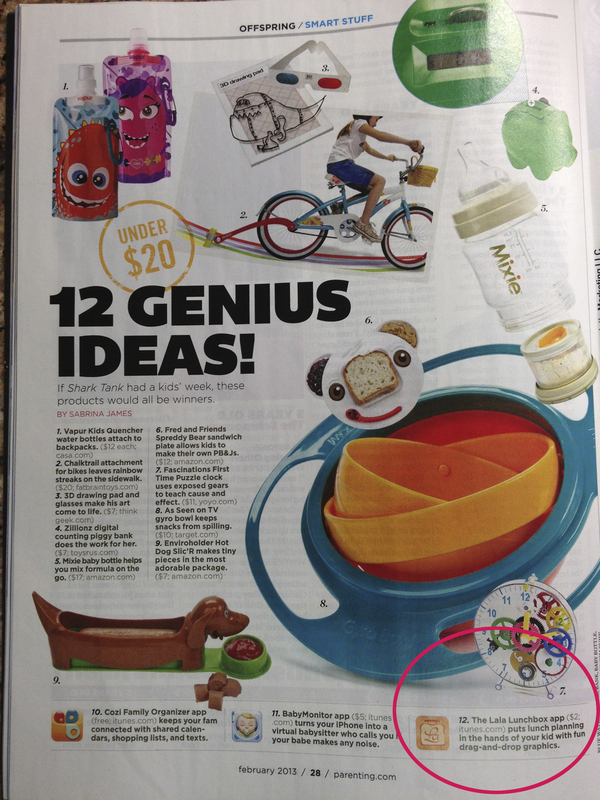 For parents, LaLa Lunchbox magically transforms kids’ choices into a simple, handy grocery list. "LaLa Lunchbox makes the dreaded school lunch duties a little bit easier. With this handy app your kids get involved in their lunch and may even get excited about eating healthier." "This super handy resource helps you come up with ideas and keep track of lunch-packing for your brood." "Raise your hand if you need a little lunchbox inspiration? LaLa Lunchbox can help." "With LaLa Lunchbox, you can take a deep breath and know that help is an app away." "It helps kids get involved in their lunch planning and emphasizes healthy foods like fruits and veggies by giving them a kid-friendly animated touch." "This is such a cute app that helps make packing lunches fun for little ones and easier for parents... Plus the choices are completely customizable by you - now how smart is that?!" "She’ll enjoy playing with this app and feeling in control over what goes in her lunchbox." "The app is very engaging... Given all kids love affair with iPhones, it seems a no brainer way to get them engaged with lunch planning." "Impressed with new app for nutritious school lunches. Kids will be excited to choose their foods." "With the different colors and cute monsters, children are learning how to make healthy choices all while helping you cut down the time you spend packing lunches." "I think this lunch packing app has the potential to change your life as you know it." "The iPhone app LaLa Breakfast ingeniously pulls your kids into the process by turning meal planning into a game." "If you have kids who are picky eaters, go download... LaLa Lunchbox on iTunes." La La Lunchbox is an engaging and educational app—just what I like as a mom and food and nutrition expert. My children assemble their lunches, talk about the foods they are choosing with me and each other at the same time thinking that they are playing a "video game". It is a great tool for the good eater and the picky eater. "This is one of those apps that will have you thinking, “What a great idea!” The concept is clever and the developers have done an amazing job putting it all together." Learned so many things from my supermom friends this weekend, incl genius of @LaLaLunchbox.